Continuing the momentum of the global enthusiasm generated by the broad adoption of enterprise solutions featuring AMD Ryzen PRO desktop processors, AMD showcased its new product line-up in New Delhi today. The Ryzen PRO processors bring reliability, security, and performance to address the demands of today’s enterprise workloads. These commercially-focused new desktop solutions are currently available in India from the world’s largest commercial PC suppliers - Acer, Dell, HP and Lenovo. The world's largest suppliers of commercial client desktops have endorsed Ryzen PRO based PC’s and made them available in India. 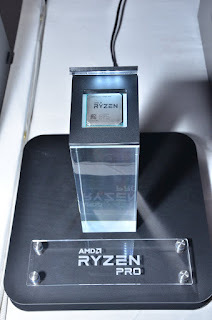 “Acer is proud to partner with AMD for the launch of their new Ryzen PRO commercial CPUs in India. Adding to the strong Acer line-up of AMD powered PCs, we are happy to introduce the Acer Veriton M200 with the latest Ryzen PRO processors in both tower and small form factor systems. We are excited to continue to grow the Acer/AMD business in India with AMD’s game changing Ryzen PRO CPUs,” said Sudhir Goel, Head of Commercial Business Group, Acer India.